In collaboration with Christian Duvernois the following entry was awarded the People’s Choice First Place. Minor Notes: The day we began the competition Chris Teeter of Metamechanics had visited a late 80′s Michael Graves home in the Hamptons with mechanical engineer Kevin Gallen. The home is unpublished as far as he knows. The home had round ship windows in many places. The siding was flat tongue and groove and the basement was 6′ deep – flawless concrete foundation walls serving only one purpose – space for routing of central air ductwork. The home had a boiler plant in a small cottage and a croquet field, is there such a thing? We had thought about using balloons as the roof structure, not sure why we abandoned that idea, but that was the winning entry! 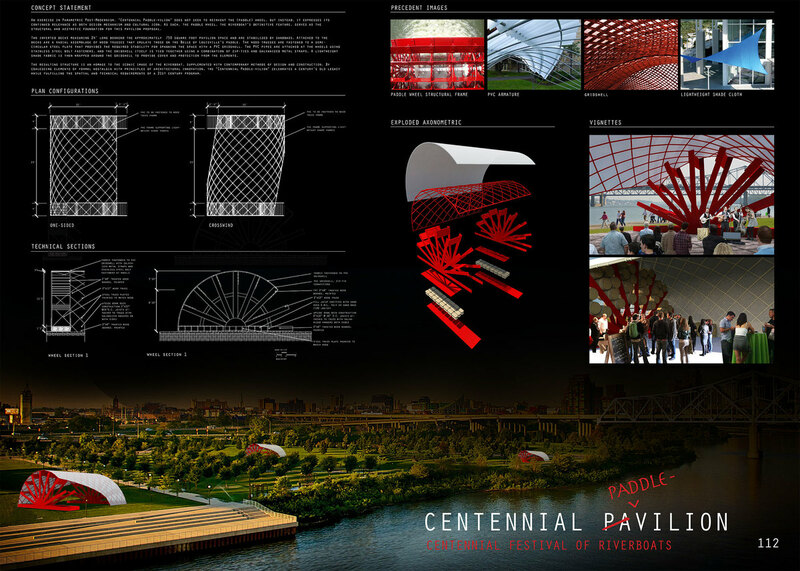 An exercise in Parametric Post-Modernism, “Centennial Paddle-vilion” does not seek to reinvent the (paddle) wheel, but instead, it expresses its continued relevance as both design mechanism and cultural icon. As such, the paddle wheel, the riverboat’s definitive feature, serves as the structural and aesthetic foundation for this pavilion proposal. Two inverted decks measuring 24’ long bookend the approximately 750 square foot pavilion space and are stabilized by sandbags. Attached to the decks are a radial assemblage of wood trusses that emulate those on the Belle of Louisville’s paddle. The wood trusses are fastened to a semi-circular steel plate that provides the required stability for spanning the space with a PVC gridshell. The PVC pipes are attached at the wheels using stainless steel bolt fasteners, and the gridshell itself is tied together using a combination of zip-ties and galvanized metal straps. A lightweight shade fabric is then wrapped around the gridshell to provide cover and protection from the elements. The resulting structure is an homage to the iconic image of the riverboat, supplemented with contemporary methods of design and construction. 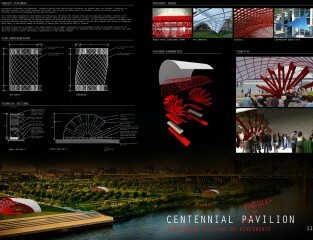 By coalescing elements of formal nostalgia with principles of architectural innovation, the “Centennial Paddle-vilion” celebrates a century’s old legacy while fulfilling the spatial and technical requirements of a 21st century program.